Crossed the auction block, yada yada yada, it's a done deal. Last month we learned that comedian and longtime Porsche enthusiast Jerry Seinfeld is also a Lotus guy. His customized 2009 Lotus Exige S260 was set to cross the auction block over Memorial Day Weekend with an estimated sale price between $65,000 and $75,000. Not only has the Exige found a new home, but that dollar amount was even higher than expected: $90,400. Seinfeld wasn’t the seller, nor was he the most recent owner. He actually sold the car back in 2012, but the fact that he was its original buyer very likely contributed to its near six-figure price tag (non-Seinfeld owned Exige S260s top off at around $60,000). That’s not a lot considering some of the Porsches he decide to part ways with have sold for millions. Powered by a supercharged 1.8-liter four-cylinder with 257 hp and paired to a six-speed manual, Seinfeld ordered the Lotus with a unique exterior paint color, Kawasaki Green. There’s just 3,988 miles on its clock. 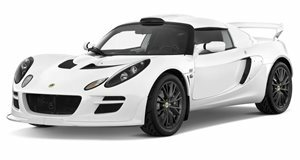 Only 50 examples of the Exige S260 made their way stateside before Lotus ceased Elise and Exige sales there.